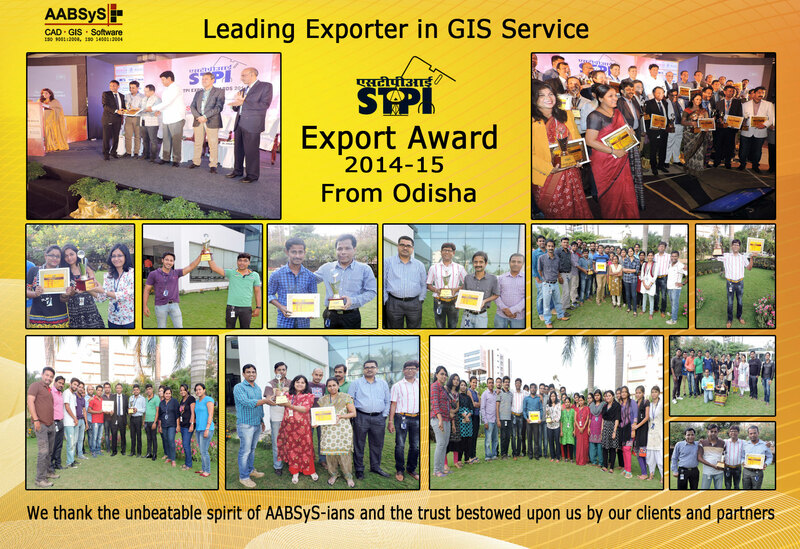 AABSyS Information Technology Private Limited, a premier GIS, CAD and software services company in India, has been conferred the award of Leading Exporter in GIS Sector at the STPI Export Awards 2014-15 held at Bhubaneswar, Odisha. AABSyS IT has been recognised for contributions made to the IT Sector in the state of the Odisha, India for the year 2014-15 and has been awarded with the STPI export award in the Category “Leading exporter in GIS Sector”. The Software Technology Parks of India (STPI) confers this award as a recognition of contribution made by STP / IT units in terms of exports, employment generation, innovation and boosting the overall economy and prosperity of the State of Odisha. The award was received by AABSyS IT’s CEO & Director, Mr. Arun Patnak, in the presence of Honourable Minister (IT & Energy), Govt. of Odisha – Sri Pranab Prakash Das, Principal Secretary ( E & IT), Govt. of Odisha – Sri Pradeep Jena (IAS), Director General STPI – Sri Omkar Rai, Director STPI Bhubaneswar – Sri Manas Panda, Sr. Director STPI – Sri Devesh Tyagi. AABSyS IT thanks its customers worldwide, for their continued trust & support and the unbeatable spirit of each AABSySian, whose passion and dedicated effort has helped it to achieve this recognition. AABSyS is a leading IT company that provides GIS, CAD, Software and IT outsourcing services to its clients worldwide. The company brings together deep domain expertise, talented personnel and 17 years of experience to meet a variety of customer needs in geospatial and IT services. The company has a state-of-the-art infrastructure and world-class facility at Infocity, Bhubaneswar and maintains a highly successful track record of working with an impressive set of national and international companies.